After last nights TUF 28 finale in Las Vegas, UFC is returning to business again tonight (Sat., Dec. 1, 2018) to stage UFC Fight Night 142, from inside Adelaide Entertainment Center in Adelaide, Australia. The main headliner features an intriguing heavyweight showdown between Junior dos Santos and Tai Tuivasa. In the co-main event, former light heavyweight champion Mauricio Rua will square off against Tyson Pedro. 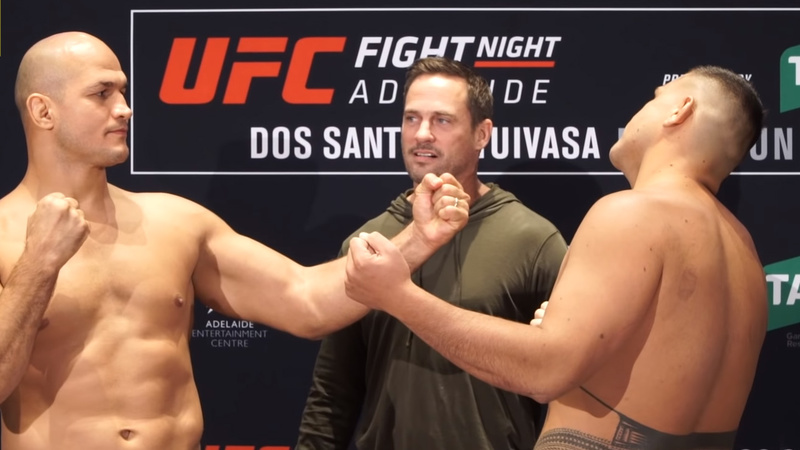 Also in another heavyweight bout, Mark Hunt will compete for the final time to meet Justin Willis. The event’s early preliminary card kicks off at 7 p.m. ET, followed by the FS1 Preliminary bouts starts at 8 p.m. ET, then the main card airs on FS1 at 10 p.m. ET. You can watch the event at UFC.com.